If you are looking for a relaxing getaway, visit our town of Graaff-Reinet and stay in our self-catering guest house, KarooRus; you will be pleasantly surprised. Our guest house is nestled in the heart of the Karoo, near the centre of Graaff-Reinet. Once you are here, there will in no doubt about why our town has been voted the best town in South Africa. We certainly could not imagine living anywhere else and we are always excited to share our little piece of paradise with visitors from far and wide. At KarooRus, you have the perfect home base from which to start your relaxing and unwinding – and exploring. Everything moves just a little slower in Graaff-Reinet and while there are many historical monuments, landmarks, art galleries, and fine dining restaurants to visit, you should do it all at a leisurely pace. Why not start off your visit with a stroll through the town? After all, everything of interest is conveniently located within walking distance of our self-catering guest house. Getting around will be no problem at all. If you need directions to anywhere specific, simply chat to us – we would love to help! 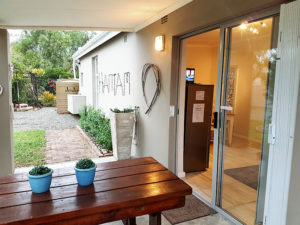 When you visit our self-catering guest house in Graaff-Reinet, you are bound to be delighted by just how comfortable and accommodating each of our seven luxury units are. Each unit is private – you even have your own entrance, whichever one you choose. With stylish and comfortable furnishings, fresh bed linen, and stylish decor, you will love every moment that you spend at our guest house. Of course, you will probably not want to spend your entire day lounging around; chances are you will want to explore Graaff-Reinet and see why people love it so much. We recommend that you get out there and experience the true beauty and spirit of the town and its surroundings. For those who love nature, the Valley of Desolation is a must-see. It is a wonder of nature and a visual delight with sheer cliffs and tall dolerite columns towering some 120 m above the floor of the valley. In the background, you can see the plains of the Camdeboo National Park. It is said that the valley is over 100 million years old. It has obviously been patiently waiting for visitors just like you! Of course, there are other places to see, such as the GRT Brewery, Gideon Scheepers Memorial, and the Anglo Boer War Memorial, to name but a few. There is no denying that a weekend or even a week at our self-catering guest house in Graaff-Reinet will do you a world of good. Turn off your phone, shut out the business world and the frantic city lifestyle, and come and enjoy all the comfort and relaxation offered at KarooRus. To make a reservation with us or to find out more about our guest house and the various facilities that we have on offer, we welcome you to get in touch with us. You can send us an email or give us a call at your convenience. Do you want to go on holiday somewhere truly beautiful? Choose Graaff-Reinet! There is a reason why Graaff-Reinet has been voted the best town in South Africa and there is a reason why we have chosen to have our lovely oasis of KarooRus right here. Graaff-Reinet is more than just a beautiful little town tucked away in the heart of the Karoo. It is a place where couples, families, and friends go to stay, relax, and unwind. It is a place where you can be at peace and explore to your heart’s content. If you have not yet visited the area, we would like to warmly welcome you and invite you to discover our guest house in Graaff-Reinet. Our location near the centre of the town of Graaff-Reinet is ideal. Absolutely everything is a short walk away from our luxurious self-catering units. And trust us, you will certainly want to take a stroll through our picturesque town; there are restaurants, museums, gift shops, art stores, and many other interesting sights to see all along the way. After a long day of sightseeing and discovering, our guest house is going to be exactly what you need. Each of our stylish seven self-catering units have private entrances and are designed with absolute comfort in mind. The furnishings are soft and inviting, and we provide everything that you require to enjoy a comfortable stay. Our units will leave you wanting for nothing as they include fresh linen, modern kitchen appliances, DStv, and beautiful en-suite bathrooms. You are sure to love our units, from the very moment you set foot on our trendy wooden floors. The staff at KarooRus are friendly, accommodating, and more than willing to go out of their way to ensure that your stay is simply unforgettable. If you would like to discover our guest house in Graaff-Reinet, remember to book in advance to avoid disappointment. To make a booking, or to find out more about our facilities, contact us via email or telephone at KarooRus today.